Elegant Engagements Wedding and Event Planners: Let the Party Begin! 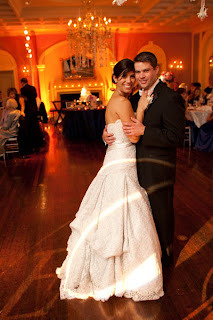 Don't you think Douglas Benedict got some great photos of the ballroom? 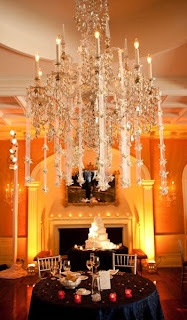 This chandelier had ribbons and orchids hanging from it - Thanks to Phoebe Flowers. 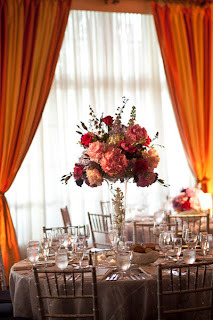 Mix of tall and short centerpieces - Linens from Select Event Rentals. Some non professional pics - Look at the band Bigg Romeo rocking the house - we had to extend the party a whole hour!! After the cake was cut, slices were placed in the dessert area along with tons of cookies, biscotti, macaroons and chocolate covered strawberries. We offered mini favor boxes so guests could take some home. The cocktail napkins in this area said "Thanks for Sharing our Story"
After dinner a cordial bar opened up and 'my cigar guy' served, cut and lite cigars for the guests - This went over very well - 50+ men and women bombarded the terrace. We had to extend the reception an additional hour because guests were having so much fun. I went around to check with the Country Club, the band and other wedding professionals to make sure they could stay (and find out overtime fees!). All in all a very successful wedding - Hope Erika and Matt are enjoying Hawaii!